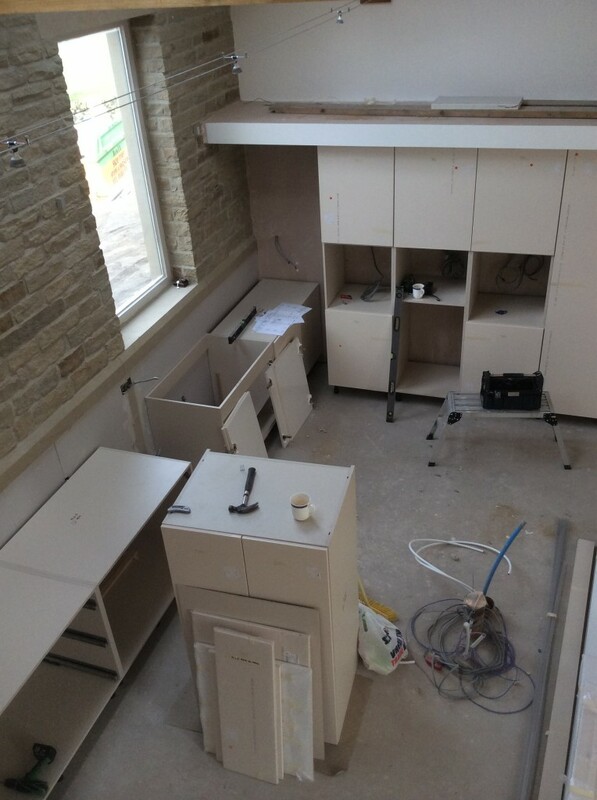 Although it will be a couple of weeks before it is finished, the kitchen has started to be installed today. By the end of this week, we should have all of the base units fitted as well as the first fix electrics and plumbing. The fitters will then make up the templates for the granite worktops. We have a gap of about a week, then the worktops and appliances are fitted. It is starting to feel like a real house now! The new kitchen has started to be fitted today. It won’t be finished for a couple of weeks, but I reckon that we will have most of the base units installed this week. The ground source heat pump is still running! After a rather “bumpy” start, I am glad to report that the ground source heat pump is still running! 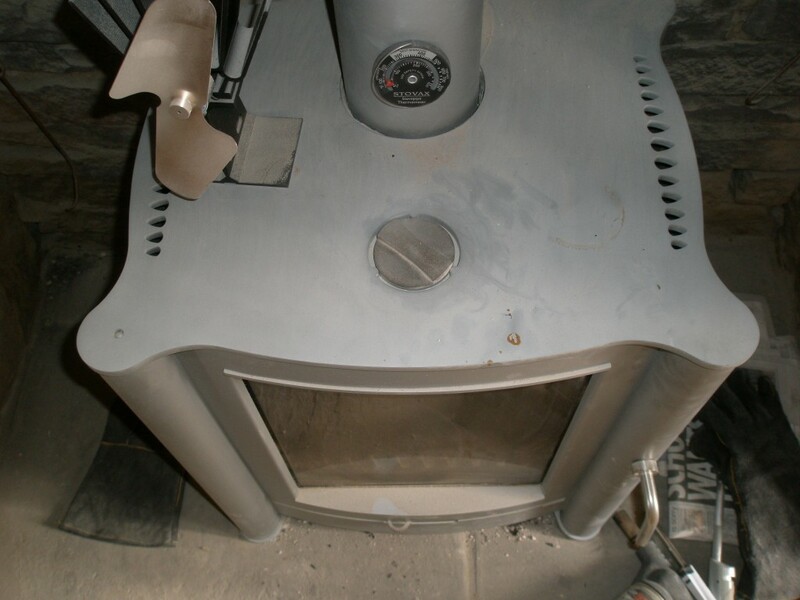 It is providing all of the heating and hot water in the house since the 12th Feb. This is much to our relief. We still have some way to go in terms of getting all the room thermostats operational – the ones in the new extension have yet to be powered up. 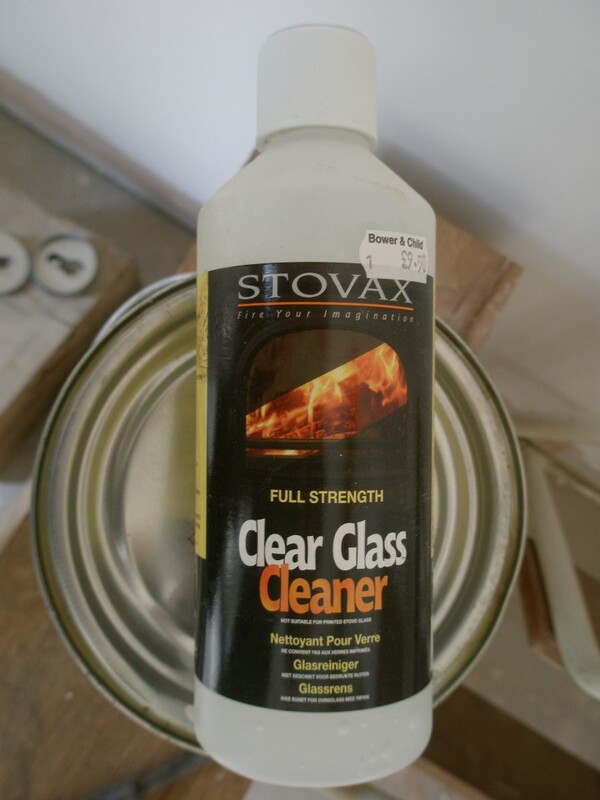 We also have builders/decorators on site and it is difficult to keep the windows and doors closed all of the time. So it is very likely that we will see some more improvements over the coming months. 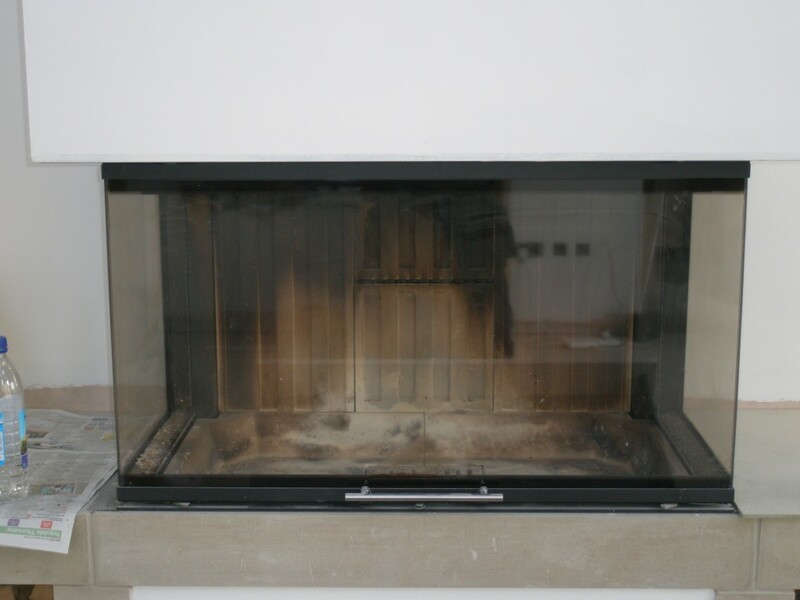 Even so, the internal temperature seems to be doing well (even without the log burners going!). However, it has yet to be fully tested in the real Yorkshire weather. Today, it is a rather barmy 10C. 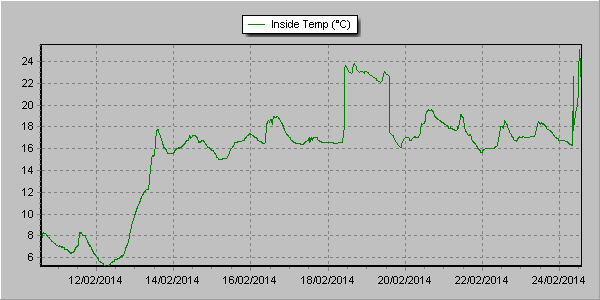 The ground source heat pump was repaired on the 12th Feb. You can see quite clearly the impact that this has had on the internal temperature of the house. The temperature gauge is in the downstairs bedroom were the temperature is set to 18C. It was also on the internal window cill where the sun (yes, it does happen occasionally in Yorkshire!) gets to it! Now where is that hole again? There were a number of pipes installed in the kitchen floor. These were for various services such as water, drainage etc. 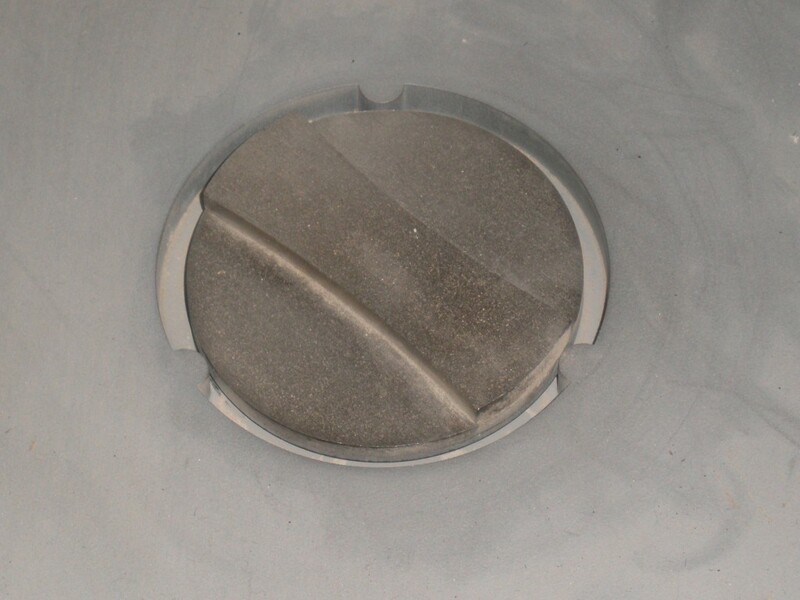 It only occurred to us a few weeks ago that one of the holes – for the extractor fan – had disappeared when the floor was screeded. The extractor pipe was fairly obvious and we had covered the top with black plastic (to ensure that no debris went down the hole). However, the chap putting down the screed seemed to think that this should have been cemented over! 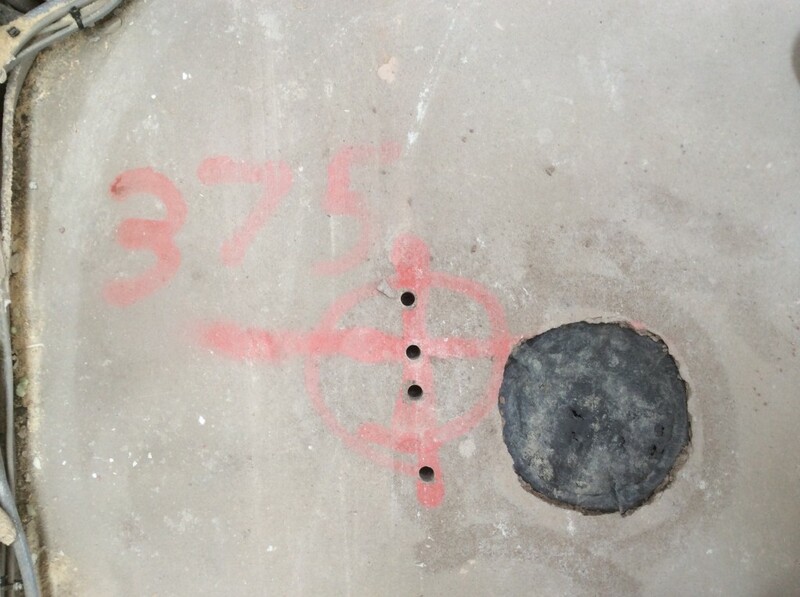 A quick look at the plan and we found the measurements for the location of the pipe. Unfortunately, it took a couple of goes to relocate it. How do we find it? We played Absolute 80’s down one end of the pipe and listened for it on the kitchen floor! Yes, really. The hole for the extractor fan should have been 375mm from the wall. It looks as if it was a little out, but thanks to Absolute 80s Radio we found it! 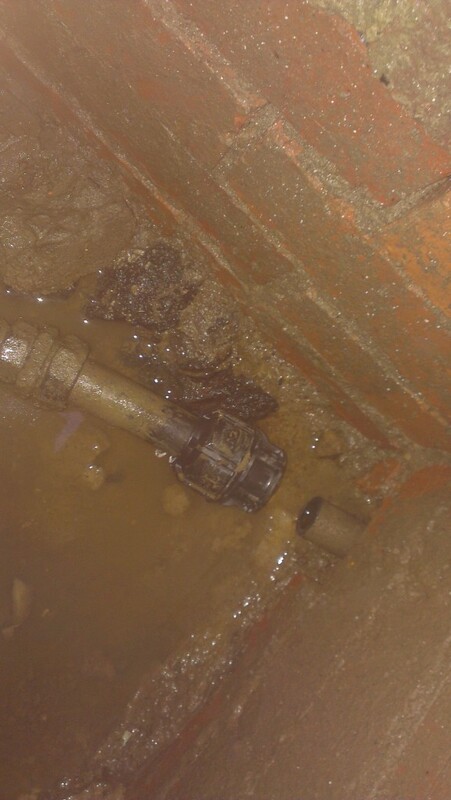 The problem with this location is that it is on someone else’s property and we are responsible for the pipework from the meter to our house (even if someone else digs it up). So we decided to have a new water connection. Cost? About £600. When I applied for the new connection, I assumed that this would include disconnecting the old connection. I was wrong. When I asked, it was going to cost around £1,000 to remove the old connection. That is more than the new connection itself! A large part of the disconnection cost is due to the traffic signals that are required on the road while the works are completed. 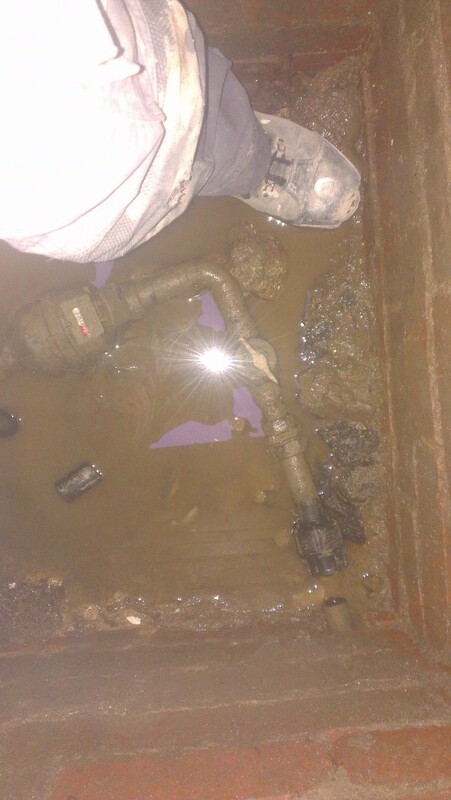 We told Yorkshire Water that they could leave the old connection there. We then had our plumber cap off the old pipework. This would stop anyone from accidentally turning the water supply back on. Last week, I talked to Yorkshire Water about the old meter and it turns out that there is no charge for the old meter – it will be associated with our account, but this is no cost associated with it. Result! On this basis, I don’t know why I would have paid to have it removed. It isn’t inconveniencing me – in fact, it is on someone else’s land. The old water meter (left above) is situated down a manhole about 200m from our property. It is actually located in someone else’s field. We are responsible for the pipework from the water meter to our house. We have now cut the water pipe and capped it off. This just leaves about 300mm of pipe from the water meter to the cap. This will prevent any problems should someone accidentally turn the supply back on. 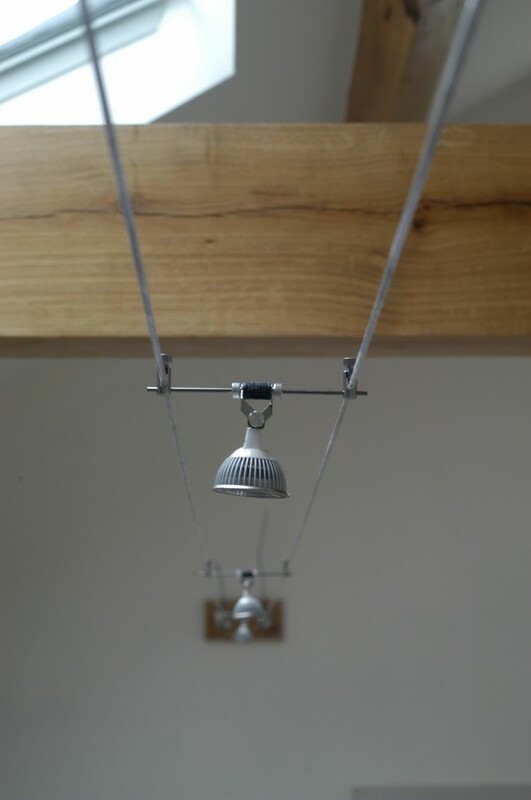 We have just installed suspended wire lighting in the kitchen. 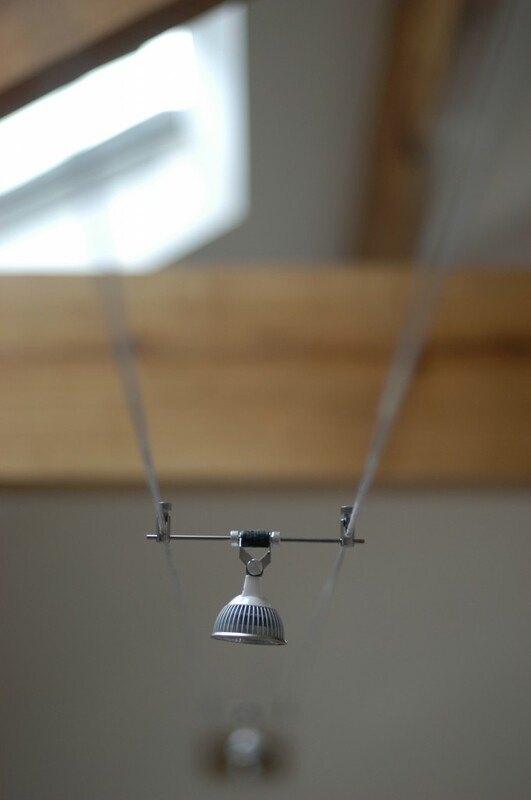 The ceiling is really too high to attach anything to the beams, so using a suspended wire system seemed like the obvious choice. There are 2 pairs of wires – one along the line of the kitchen work surfaces, the other over the breakfast bar. There are 4 lights on each. These are 12v LED lights. Each are 4.2W. So we have about 17W of lighting on each pair of wires. 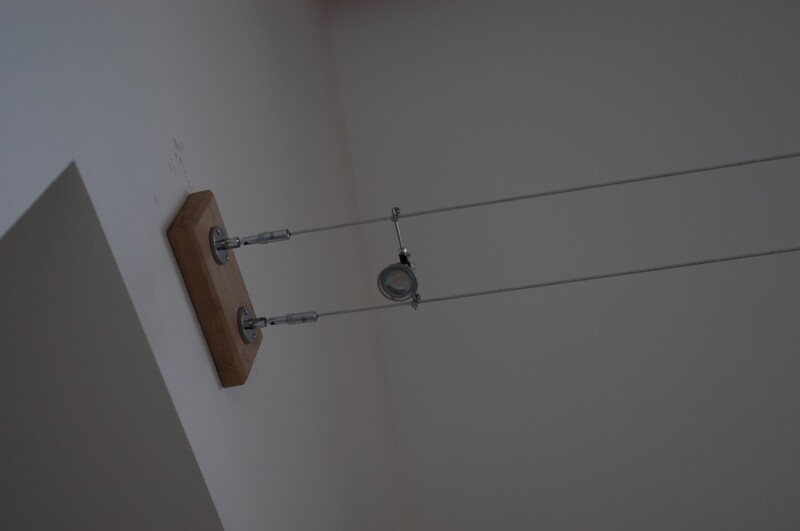 The cables are fixed to the wall using some oak mounting plaques that the joiner made. The oak was left over from building the roof, so once these pieces of oak have been treated with Osmo, they will match the rest of the oak in the kitchen. The suspended cable system is from SLV. 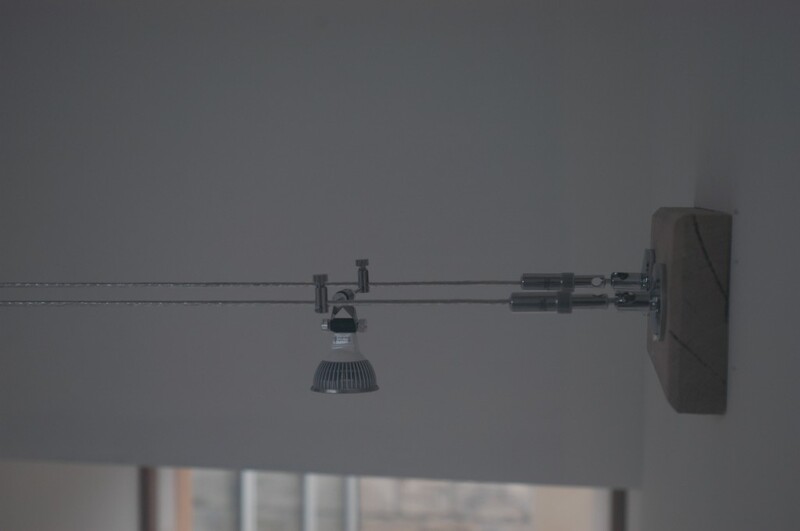 You will find the lamp holders here: http://www.slvlightingdirect.com/track-lighting/wire-12v-lighting-system/slv-181080-lamp-holder-adjustable-wire-12v-system-light-black.html. This is the view from below. Most of what you see is actually the outside of the light bulb. It will be important to make sure that we have spares should we get any failures. These are 12v MR16 LED bulbs. We have yet to get these powered up (our electrician has done with archilles tendon playing football), but hopefully we will get these up and running next week. An oak “plaque” has been screwed to the wall, then the chrome fittings are fixed to the oak. The oak was from the offcuts from the roof timbers, so by the time it has been treated with Osmo, it should all match. The bulb forms 80% of the fitting (the plastic basket is actually part of the bulb). We need to make sure that we have some spares, otherwise we might end up with some non-matching bulbs. 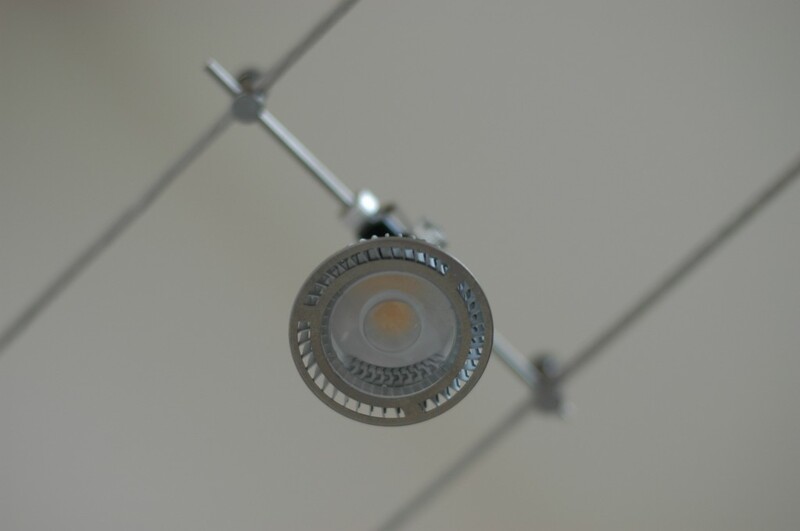 These are 12v LED bulbs that are rated for 25,000 hours, so hopefully it will be a while before we get any failures. The kitchen is due to be installed next week and we are just sorting out the lighting and the final bits of decorating. We are using Collingwood MC020-S LED up/down lights. These are only 1W each (or rather 1W up and 1W down) and cast out an amazing about of light. 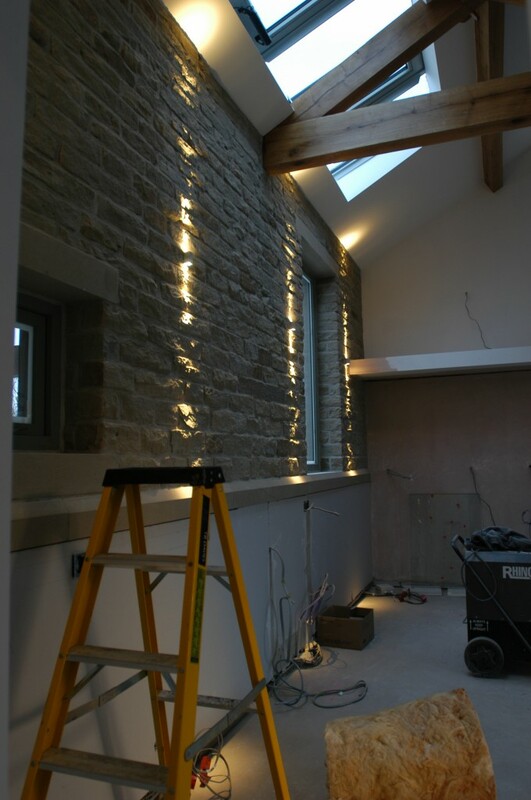 The light on the furthest left needs to be adjusted (look at the shape of the light on the ceiling), but these start to show off the texture of the reclaimed stone wall. This is the view into the kitchen from the opening in the hallway. There will be a row of kitchen units along this wall once the kitchen is installed. 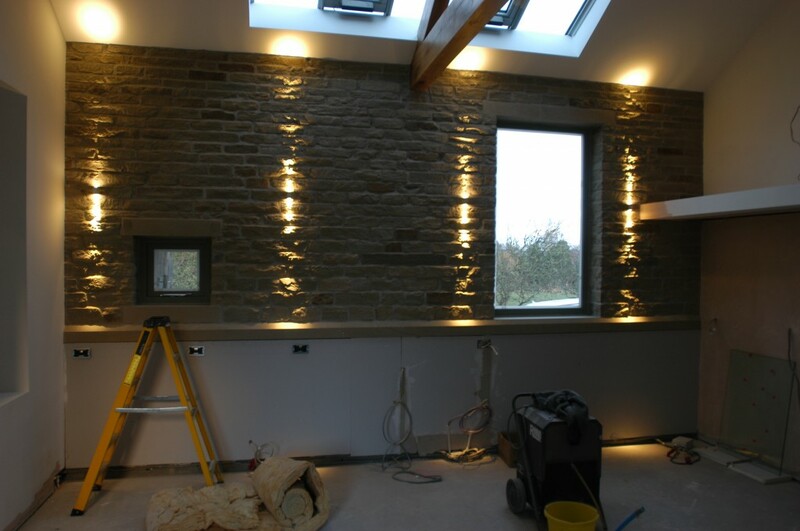 These are the lights that we are using on the kitchen wall as well as the parapet wall above the staircase. The line of lights in the kitchen matches the line of lights on the parapet wall. These are Collingwood MC020S LED up/down lights. 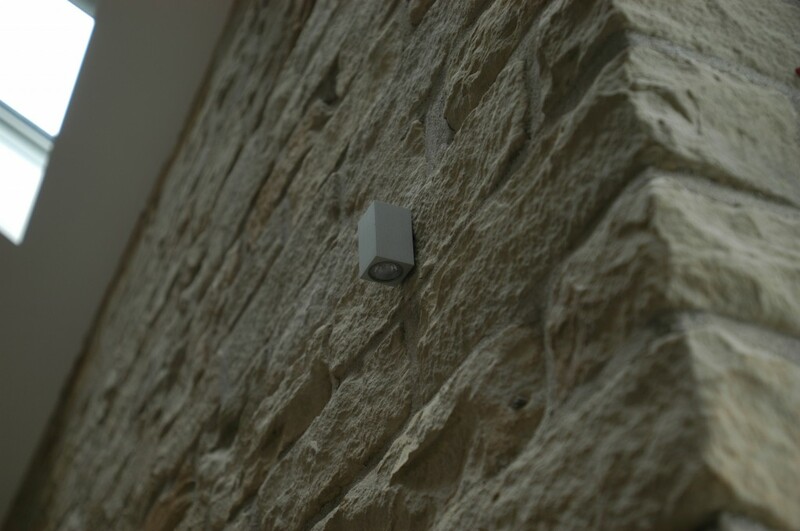 You can hardly see them when they are switched off – they seem to blend into the stonework.